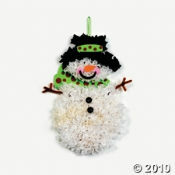 This snowman tissue craft kit is fun and easy for kids. You can find it at the Oriental Trading Company. ..along with lots of fun party supplies, party favor ideas and fun toys that are perfect for a party game prize! You will need to supply your own craft glue...that doesn't come with the kit, but it should have everything you need. So what are you waiting for? Order it now! Join in and write your own page! It's easy to do. How? Simply click here to return to Snowman Christmas Crafts.